Vanadiumcorp Resource Inc. engaged IOS Services Geoscientifiques Inc. (‘IOS’) for the purpose of compiling the PEA. IOS is a thoroughly independent consulting firm and one of the largest independent consulting firms in geology in the Province of Quebec, having been involved with more than 1,400 projects. IOS collaborated with the development of the Lac Doré project for more than 20 years, as the contracted developer and project manager for its previous owner. IOS utilized its extensive knowledge and data pertaining to the significant mineralization present on VanadiumCorp’s Lac Dore project. The Lac Dore 2017 PEA is preliminary in nature and includes exclusively Inferred Mineral Resources that are considered too speculative geologically to have the economic considerations applied to them that would enable them to be categorized as Mineral Reserves. There is no certainty that the PEA will be realized. Inputs and assumptions used in the study are shown in the following tables. All prices are stated in Canadian dollars, and tons as metric measure. The average LOM operating expense is estimated at CDN$56.89 per tonne of VTM, or 42% of selling price. 1.34 tons of waste per ton of ore. Environment taxes on tailing, effluents, dusts, and water. Municipal and school taxes on non-production related investments. Federal income tax (15%) after allocations. No royalties are attached to the project. All pre-construction costs were included in the economic studies, including operating cash flows for the Company, resource definition costs, metallurgical testing, engineering and provisions for environmental rehabilitation. The NPV and IRR calculations include the four pre-production years and are summarized in the table below. Multivariate sensitivity analysis has been conducted by fluctuating capital expenditures (-30%/+50%), mine and mill operating cost (-30%/+30%), VTM grade (20%-35%), pit ratio (0.8-1.67), currency exchange (0.60$/1.00$ US/CND), VTM pricing (50US$/ton-150US $/ton), scale (17-300tph VTM), interest rate (5%-25%) and equity/debt ratio (0%-90%). The economics are quite robust, maintaining positive cashflows even over protracted and extremely unfavorable conditions. The most sensitive parameter remains the VTM selling price, which will be dictated by the contract with a non arms-length processing metallurgical facility. 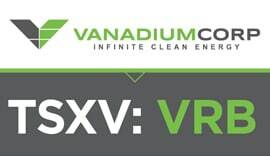 The decision to dissociate VTM production at the mine site from vanadium extraction of the VTM is based on the premise that the contemplated process is currently being developed and its economic outcome is currently too speculative to the included in the current study. Intensive smelting of VTM currently accounts for 73% of the world vanadium production, with vanadium being only a by-product of smelting. Consequently, most steel and vanadium smelting plants outside of China and Russia are currently troubled or shut down. Difficulties with this process reside in the elevated cost of steel production compared to conventional blast furnaces, which cannot be compensated by the credits from the slag. Similarly, the conventional salt roasting process, used by every primary vanadium producer, has been demonstrated as not economically robust in the current stringent environmental regulation and harsh climatic conditions, and disregarded. Since late December 2016, VanadiumCorp initiated a partnership with Electrochem Technologies and Material Inc. (Montreal, Québec) “Electrochem” to assess the metallurgical and chemical processing of the vanadiferous magnetite from Lac Dore at Electrochem’s facilities located in Bourcherville, Québec. Testing of the VanadiumCorp-Electrochem digestion process on Lac Doré VTM successfully produced pure vanadium chemicals, copperas and titanium dioxide. Then, copperas can be converted using vertically integrated Electrochem’s patented electrochemical technology (Canadian Patent CA 2,717,887 C) to produce 99.9% pure electrolytic iron and to regenerate acid.. The novel patent pending chemical technology (US Provisional Patent Application US 62/463,411) is jointly owned by VanadiumCorp Resources (50%) and Electrochem Technologies & Materials Inc. (50%). The chemical and electrochemical processes invented and currently tested by Dr. Francois Cardarelli President of Electrochem Technologies and Materials Inc. would be the cleanest process for the production of vanadium chemical as well as for production of pure iron for the steel or manufacturing industry. As the process does not involve carbon-based pyrometallurgy, it will generate a minimum amount of greenhouse gases emission as well as very little residues. Its power consumption is estimated at about half of that involved in smelting or roasting processes. About 120 workers will be required to support the mine operation, which can all be drawn from local communities. Chibougamaubeing a former mining town, the population is acquainted to mining activity and anticipated to be supportive of the project. The results of the current PEA will be used to justify systematic drilling to upgrade the resource, as well as to test VanadiumCorp-Electrochem chemical technology and Electrochem’s electrochemical technology at a pilot plant scale. The PEA further aims to evaluate the economics of developing the project for the production of vanadiferous titanomagnetite (VTM) concentrate, to be used or sold for its processing. VanadiumCorp will be filing a National Instrument (NI) 43-101 Technical Report on the Lac Dore 2017 PEA within 45 days of this news release. Readers are cautioned that the Lac Dore 2017 PEA is preliminary in nature and is based on Inferred Mineral Resources that are considered too speculative geologically to have the economic considerations applied to them that would enable them to be categorized as Mineral Reserves. There is no certainty that the PEA will be realized. There is no certainty that the Inferred Resources will be converted to the Indicated or Measured categories, or that the potential Indicated or Measured Resources would be converted to the Proven or Probable Mineral Reserve categories. Mineral Resources that are not Mineral Reserves do not have demonstrated economic viability. The estimates of Mineral Resources in the PEA and the Mineral Resource statement may be materially affected by environmental, permitting, legal, title, taxation, socio-political, marketing, or other relevant issues. The Lac Dore 2017 PEA recommends that the Lac Dore Project be advanced to a pre-feasibility study level in order to increase confidence in the estimates. The Lac Dore 2017 PEA was prepared by IOS and is based on a Mineral Resource estimate for the Lac Dore Vanadium Project published as a NI 43-101 Technical Report with an effective date of May 21, 2015. The following Qualified Persons have participated in the development of the PEA or are responsible for specific inputs into the PEA. This release was approved by Rejean Girard, P.Geo., and independent consultant to VanadiumCorp. Mr. Girard is a qualified person as defined by National Instrument 43-101. Portions related to the resource estimation have also been approved by Christian D’Amours, P. Geo, independent consultant to VanadiumCorp. and a qualified person as defined by National Instrument 43-101.